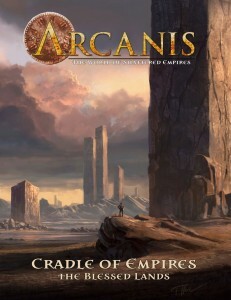 Paradigm Concepts has a Kickstarter underway for their new sourcebook for Arcanis. This one's The Cradle of Empires. While the Cradle of Empires sourcebook has new rules to support the setting, the majority of the manuscript is story and source material - so dropping it into an existing campaign as a remote and mysterious region is no problem. Use another system? Then just adapt the robust setting and history to whatever game system you're using to add a deeper, richer playing environment for your current campaign!